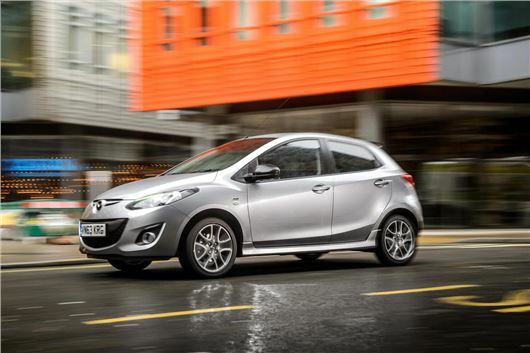 Mazda has introduced Colour Edition and Sport Colour Edition variants of the Mazda2. Features include extra equipment, Colour Edition badges and an interior to with details to match one of three exterior colours – pearlescent Crystal White, metallic Aluminium Silver and solid True Red. Prices start at £11,745 for the Colour Edition and £12,845 for the Sport Colour Edition. The Colour Edition comes with a 75PS 1.3-litre petrol engine and features 15-inch alloy wheels, privacy glass, black door mirror caps, a rear spoiler, red interior upholstery piping, Bluetooth and body-coloured interior details, like the air vent surrounds. The Sport Colour Editon has a more powerful 85PS version of the 1.3-litre engine, and gains 16-inch alloy wheels, Sports styling kit, Sports headlamps, plus a satellite navigation system, more air bags and improved audio. It costs £1100 more than the standard Colour Edition. Both the Colour Edition models are limited to 1000 units each and every car will feature a numbered plaque.